Take a look around to learn more about us. We specialize in hand-crafted and innovative jewelry, custom designed to enhance your unique identity and lifestyle. New and refreshing beads, necklaces, bracelets and earrings from our own, in-house designer and qualified gemologist. This is a picture of red jasper carved center piece enhanced by picture jasper cylinders accompanied by a pair of red jasper earrings. From nature we have a boulder of mookaite jasper and carved beads of picture jasper. And for the experienced or beginner collector, we have a carefully selected collection of rocks and mineral specimens. 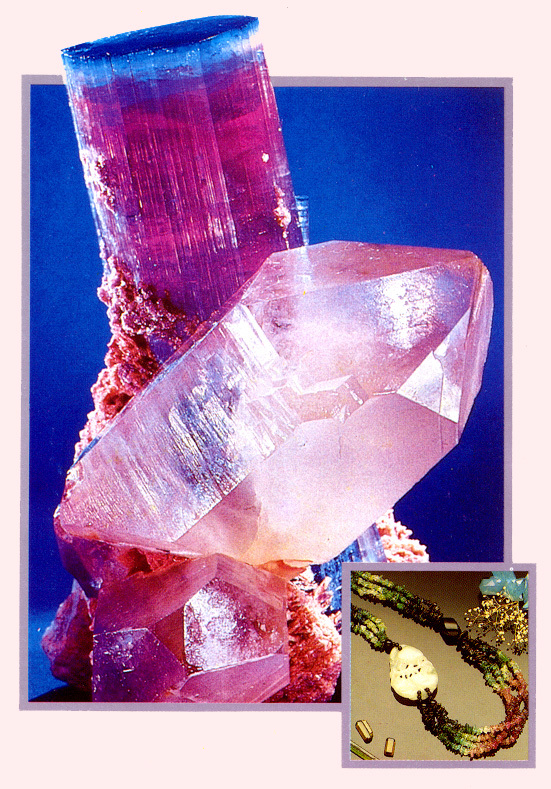 Some are specially cut for the use in the Art of Crystal Healing. The photo depicts a perfect sample of a beautiful mineral specimen of tourmaline and quartz crystal from Maine, USA. Below are some reference books that I have found very useful. You might like to take a look.